My mother’s daddy was a farmer. He raised tobacco. 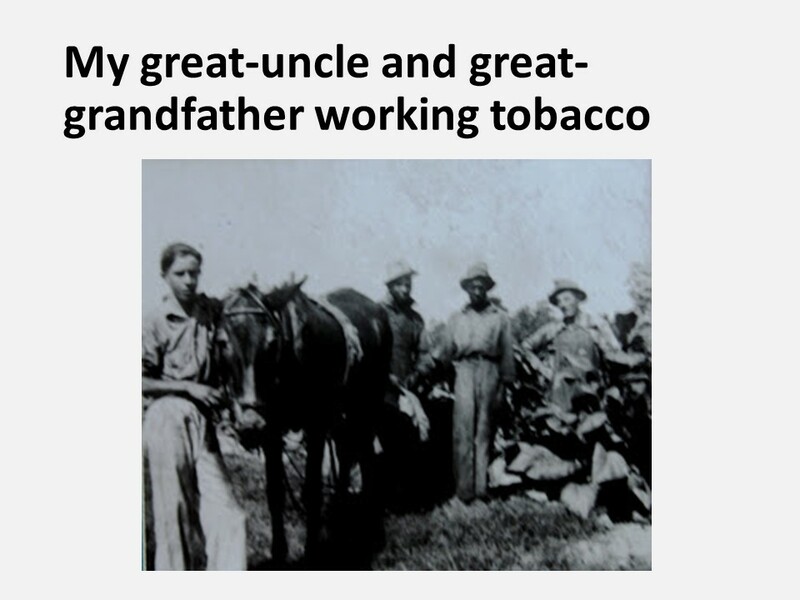 People never talked about growing tobacco. You grew corn, soybeans and alfalfa. Tobacco, you raise, much like children. It takes time and patience. Lots of patience. It was hard work that started in the middle of the winter. By February, on a sunny spot on my granddaddy’s farm there’d be hot boxes covered in white cloth spread out on the ground. From a distance, it looked like snow. Here, tobacco seeds were sown and nursed to life. When the threat of frost was over, granddaddy would transplant the young seedlings into prepared soil for the summer. For the next few months, granddaddy watched the plants carefully. He died before herbicides became overly popular, and before specialized tractors and machinery came of vogue. 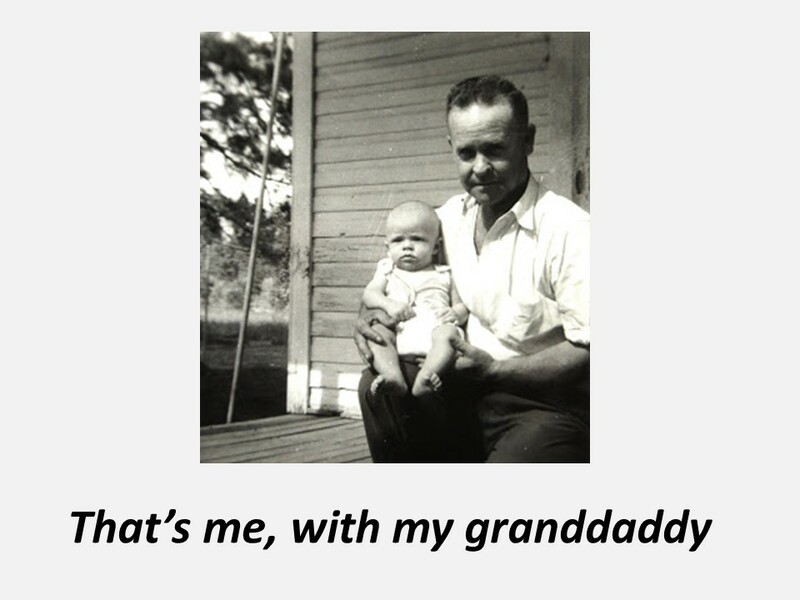 So granddaddy would take his mule, “Hoe Handle,” and run between the rows with a plow, knocking down the weeds. Then he and a hired hand would come between the plants with a hoe and chop out any weeds still standing. As the plants grew, my granddaddy would look at the clouds, hoping for rain which brought more growth, but not hail which could ruin a crop and not too heavy of a rain that would splatter the lower leaves with mud and make them less valuable. There was always something that could happen. The leaves were cropped (or picked) and tied to sticks and placed in a heated barn to dry. A slip of a tobacco stick would cause the leaves to fall into the fire and burst into flames. In a moment, a chuck of his labor, all the drying tobacco along with the barn itself, became premature smoke. It took care and patience to raise a crop. Be patience, James tells us. And then he follows his advice with an example of a farmer waiting on rain. A farmer is a useful example for us to understand this passage, for being patient didn’t mean to sit idly around waiting for God to intervene. There’s still stuff to be done while waiting for the rain, especially if we want to have a hope of a harvest. For the farmer, there were fields to be worked, equipment to be repaired, supplies to be gathered. As Christians, as James has shown throughout the book, we can’t just rest and depend on our faith. We, too, have work to do. Let’s look at James’ message. If you remember, James ended the fourth and began the fifth chapter with a rant. In today’s reading he returns to his familiar style, referring to his readers as brothers or siblings. The “therefore” at the beginning of verse seven implies that James is giving advice of how they should handle the situation we’ve explored last week, where rich landowners were cheating their workers their wages. Although James had words of judgment for those who abuse their laborers, his primary audience are those who are hurt by such actions. James encourages these workers to be patient and not to be grumbling with one another as they wait for the coming of the Lord. Although James only specifically mentions Jesus twice in this book, back in the first two chapters, he is writing from a Christian perspective. He’s anticipating Christ’s return, when things will be make things right. He refers to the rainy cycles in Palestine. The early rains came in late fall and early winter and provided groundwater for the growth in early spring and the first harvest. The late rains came in late spring and provided a bountiful summer harvest. Of course, when the rains didn’t come, as in the reference to Elijah, people suffered. It seems to me that perhaps James’ audience, along with us, are living in that period between the first and second rain. The first sweet rain was Jesus’ first coming, the second is his return. 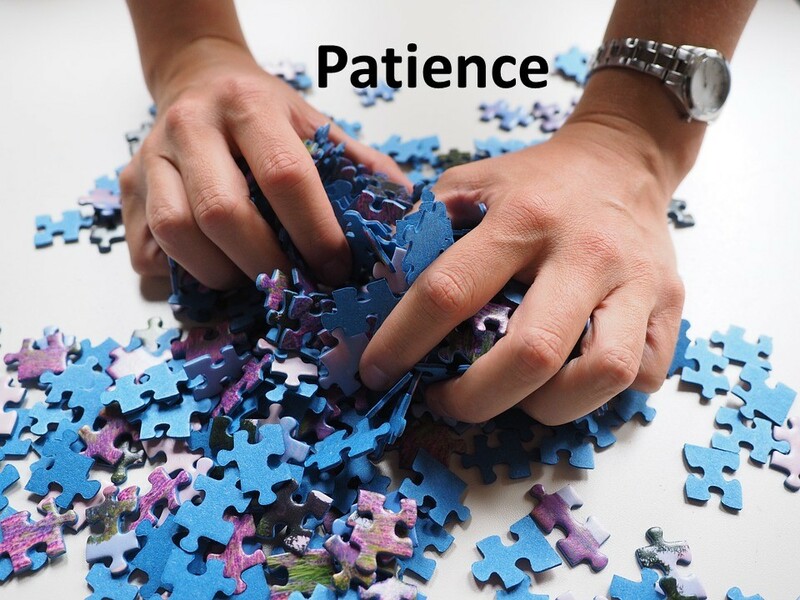 James wants his readers to be ready and to wait with expectancy and hope (but not laziness). Next, James throws a curve-ball. “Don’t swear,” he says. Where does this come from? It’s as if James had a thought that popped into his head that he wanted to make sure he conveyed. James believes that believers should have such integrity that their word is all that’s needed. Oaths, therefore, are unnecessary. 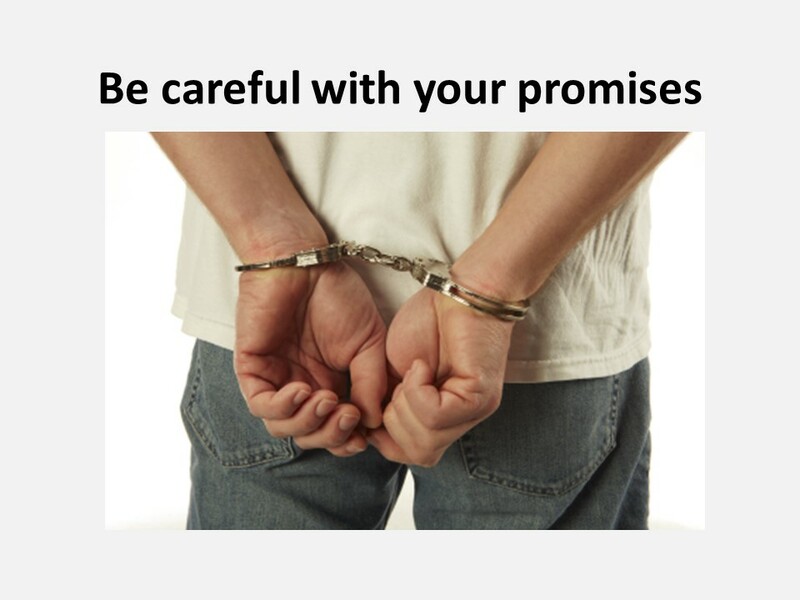 It seems truth has become so a precious commodity in our day in which, at least some people, think that because they say it’s so, it’s so, as if words “construct reality.” But as people who place our ultimate allegiance in Jesus, who is the truth, we must be careful that our words are not carelessly used. They must reflect what is true. It used to be that one of the highest honors one could have is to be said that your word is your bond. Today, we need to reclaim such emphasis. Don’t swear that you’re going to do something, just do it, if it’s a good idea. We need to remember that sometimes when we “swear” we’ll do something, we put ourselves into a bind. Bede, a 7th Century English mystic, in a sermon on this passage, recalled the oath Herod made to his step-daughter. You remember, he’d give her whatever she wanted if she danced for him. And, upon her mother’s advice, she asked for the head of John the Baptist. Having publicly made an oath, Herod felt he had no other choice, even though it was not what he wanted to do. Bede’s example shows us the danger of us swearing we’re going to do something. As James emphasizes throughout this Epistle, we must be careful with our words. 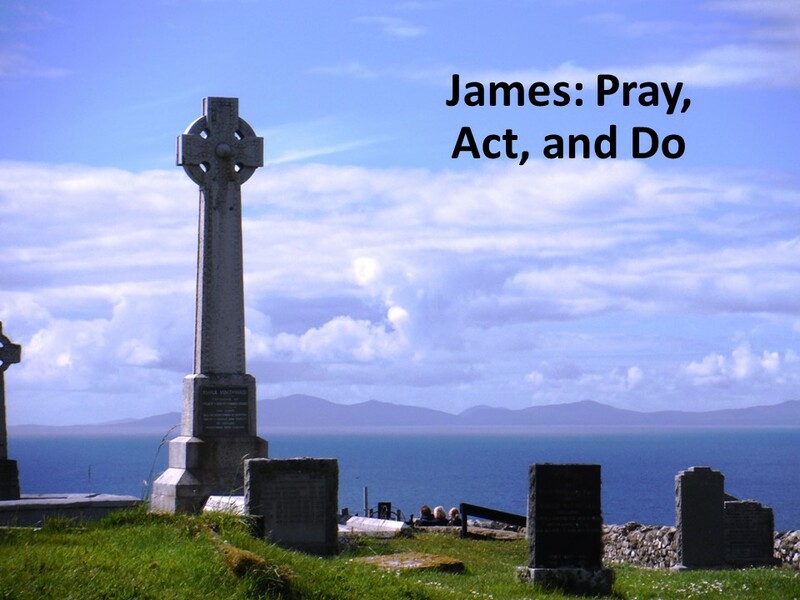 James moves next to the topic of prayer. We pray when we have needs and when we are grateful and thankful. We pray for others, including having the elders lay hands on the sick and anointing them with oil. Our prayers are also to be honest with God, who already knows all. We confess our sins, both to one another and to God. I know some churches have done away with Prayers of Confession, but it is a fundamental part of worship. James makes this clear. By confessing to God and one another, we can experience the forgiveness of sin. Prayer is important, we might think, but very private. And that’s right, to a certain extent. However, James shows the importance of not just private prayer but corporate prayer, prayers that we say with others. As members of the church and followers of our Lord, we should be doing both. We need to pray for ourselves. 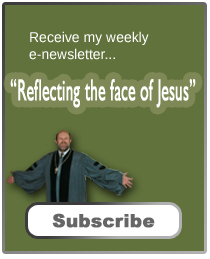 We need to pray for others (if you don’t know where to start, take home your newsletter and go through it during the week, praying for those mentioned). We need to pray for the leaders of our church and of the world. And we need to be honest, confessing our sins. James conclusion to his letter expresses his hope. The first century church that James addressed wasn’t perfect. 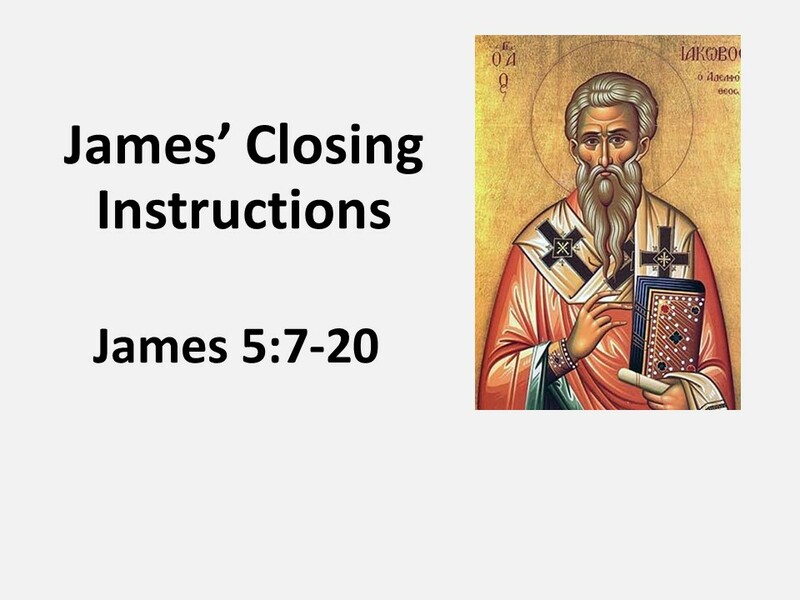 There were a lot of problems as James and others in the New Testament attest. People were leaving the church. 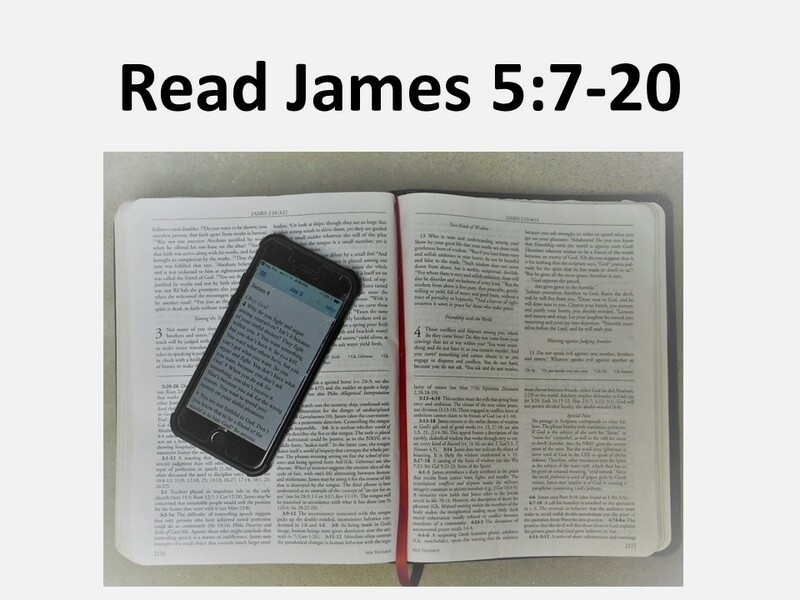 James encourages the faithful to reach out to those who are wandering lost, promising them that if they bring them back into the fold, back to Jesus, back into his church, they will not only save the sinner, but will cover a multitude of sins. There’s been lots of debate as to what this means. 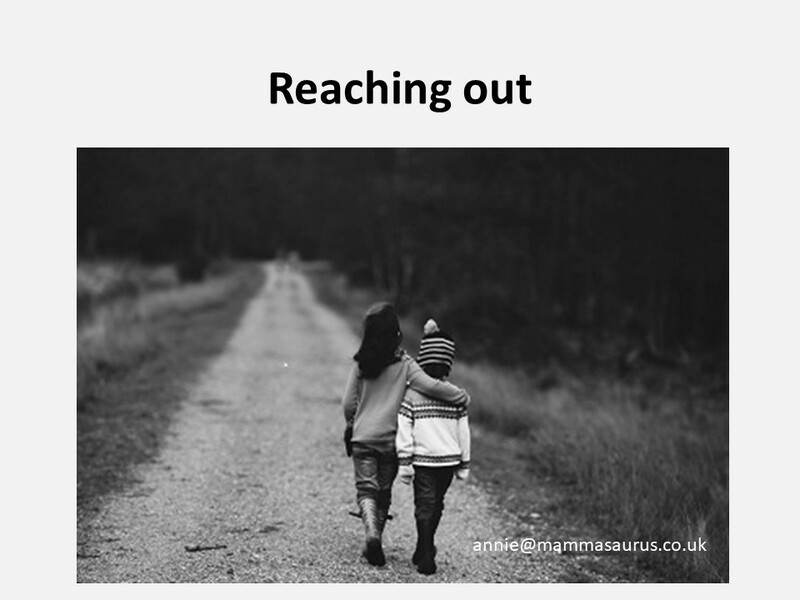 By reaching out and reclaiming a sinner, does this action cover the sinner’s sins or others? It could be argued either way, but what’s more important here, in the context of the whole paragraph, is the community. The sinner’s sin is something the community needs to deal with (James has already made the case for the community’s prayers of confession). In the first letter of Peter, we have a similar saying in which Peter informs us that “love covers a multitude of sin.” James wants the community to be a loving community, caring for one another. When we return a sinner to the right path, we are acting in love. When we pray for one another, we act in love. And as James has points out, when we help those in need, especially the poor, we act in love. James doesn’t end his letter with prayer as a way to give us an out for not having to do anything else. He assumes that along with our prayer, we will reach out and be helpful, whether it is bringing back a sinner into the fellowship or caring for the needs of the poor. Our actions and a prayers must go together as we patiently wait in faith for what God has planned for the future. As we’ve been talking about farmers, let me close with this story. A pastor was having dinner with an old farmer. The farmer began to pray. “Lord, I hate buttermilk. Dan G. McCartney, James: Baker Exegetical Commentary on the New Testament (Grand Rapids, MI: Baker, 2009), 240. Romans 12:19 and Deuteronomy 32:25. I’m adapted the phrase “construct reality” from the title of Peter Berger’s The Social Construction of Reality (1966). Quote from Bede in the Ancient Christian Commentary on Scripture, New Testament XI, edited by Gerald Bray (Drower’s Grove, IL: Intervarsity Press, 2000 ), 59. John Climacus, A Ladder of Divine Ascent as quoted by Kathleen Norris in Amazing Grace: A Vocabulary of Faith (New York: Riverhead Books, 1988), 58.